Formin was 18. She was sitting on a plastic stool in a bamboo shelter at a refugee camp in Bangladesh. 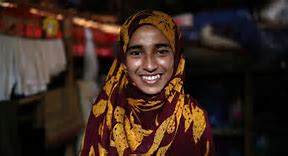 Like the hundreds of thousands of Rohingya refugees around her, she and her family had fled a campaign of mass murder, rapes and arson in Myanmar the previous year. But Formin wanted to talk about Keller, the deaf and blind American author she considered an inspiration. She wanted to talk about Pakistani activist and Nobel Peace Prize winner Malala Yousafzai, another hero. She wanted to talk about her books ravaged in the burning of her house amid deadly violence in Myanmar’s northern Rakhine state. She spoke of her dream of becoming a lawyer, and of inspiring other Rohingya girls deprived of education. Alhamdolillah. Some good News for a change.